The Gatekeeper of the Fringe is a gigantic creature constructed from an unnerving collection of body parts. Its appearance resembles that of a large Flesh Atronach, with the exception that it has a giant weapon in place of its right arm. The unholy creation of one Relmyna Verenim, this powerful creature serves to protect the Gates of Madness, preventing unworthy adventurers from entering the Shivering Isles proper. Should an adventurer manage to defeat the Gatekeeper in battle, a new, stronger Gatekeeper is always created to replace it. 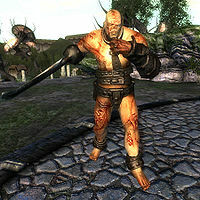 The Gatekeeper is the first major obstacle the player encounters upon entering the Shivering Isles. A new Gatekeeper can be constructed at a later point in time. The Gatekeeper has known physical weaknesses to the tears of its mother and arrows made from the bones of its failed brethren. The Gatekeeper, in both forms, is immune to Wabbajack, however it is not immune to the daedric banishing effect of Mehrunes Razor. The first gatekeeper is a quest creature, so his body does not disappear until you start Rebuilding the Gatekeeper. The one exception is SE02Gatekeeper03, which is not marked as a quest item, and which will disappear after three days. This is the Gatekeeper you encounter in The Fringe. You have to defeat this Gatekeeper to get past the gates. Regeneration - Restore Health 8pts on Self (Constant Effect). Cure Poison - 10 - Cure Poison on Self. Restore Health - 15 - Restore Health 10pts on Self. Regeneration - Restore Health 10pts on Self (Constant Effect). Restore Health - 15 - Restore Health 15pts on Self. Restore Health - 15 - Restore Health 20pts on Self. Regeneration - Restore Health 12pts on Self (Constant Effect). Restore Health - 15 - Restore Health 25pts on Self. Restore Health - 15 - Restore Health 30pts on Self. Regeneration - Restore Health 14pts on Self (Constant Effect). Restore Health - 15 - Restore Health 35pts on Self. Regeneration - Restore Health 18pts on Self (Constant Effect). Restore Health - 15 - Restore Health 40pts on Self. Regeneration - Restore Health 20pts on Self (Constant Effect). Restore Health - 15 - Restore Health 45pts on Self. * Throw Enemies is a spell that enables the Gatekeeper to throw and knockdown enemies. The effect is the same on all levels. The second Gatekeeper is the one that you help create during the Rebuilding the Gatekeeper quest. You are allowed to choose between three weapons for the Gatekeeper and whether or not it should wear a helm. This results in six (3×2) varieties in appearance. The body parts that you have chosen for the Gatekeeper determine what Greater Powers you can acquire, but also affect the Gatekeeper itself. See here for details. Note that this second Gatekeeper is much tougher than the first. * Throw Enemies is a spell that enables the Gatekeeper to throw and knockdown enemies. This page was last modified on 8 September 2016, at 22:34.